I'm a big fan of puns. I've been that way since I was in elementary school and we read a story about Ben Dover. Oh Ben. I laughed and laughed ... and I still laugh. So any time I have a chance to use a play on words, you better believe I'll take it. That's a huge reason why our engagement party favors were peppermint patties that said "Lisa & Pete: Mint To Be" on them. Oh, it's just the best. If you agree, you'll love these He Popped The Question engagement party favors ... made with popcorn because, really, that's fantastic. These were super easy to make, and they'll be even easier for you. 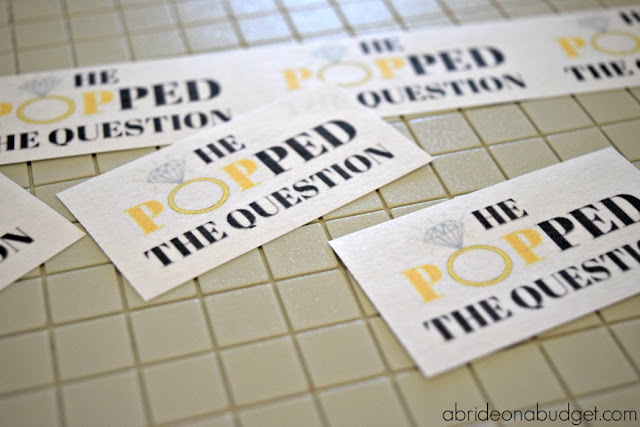 I created the "He Popped The Question" favor tags for you. 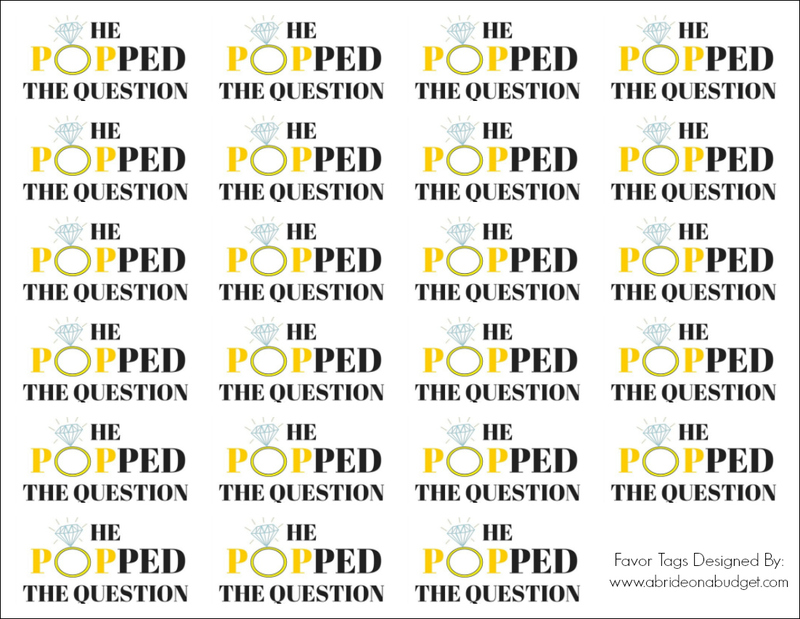 They're at the end of the post, so you don't have to make your own. 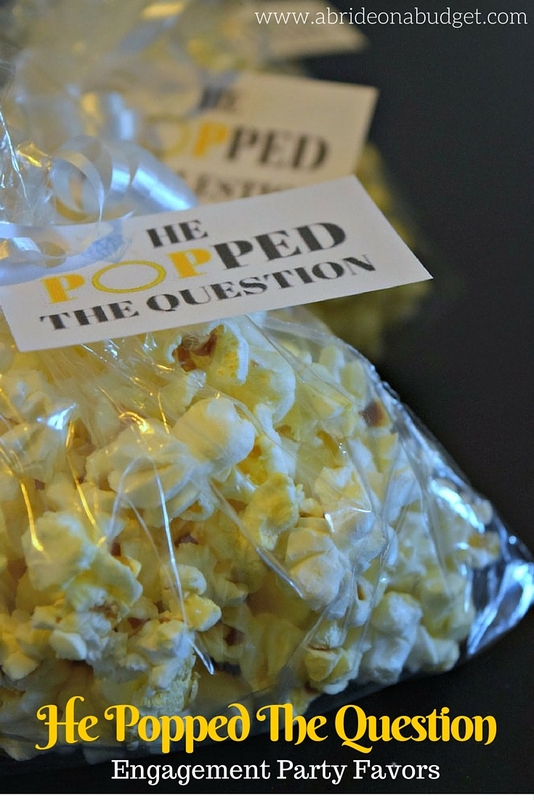 All you have to do is cut them out and attach them to your popcorn. 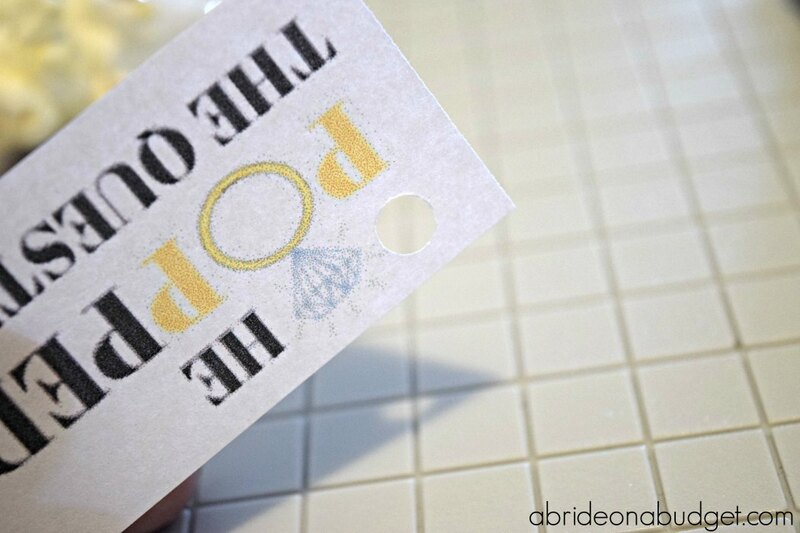 Print out the tags and cut them with your paper trimmer. They end up being about 2.5x1.25. If you want to dress them up a little, you could use a corner rounder to, as its name implies, round the corners. 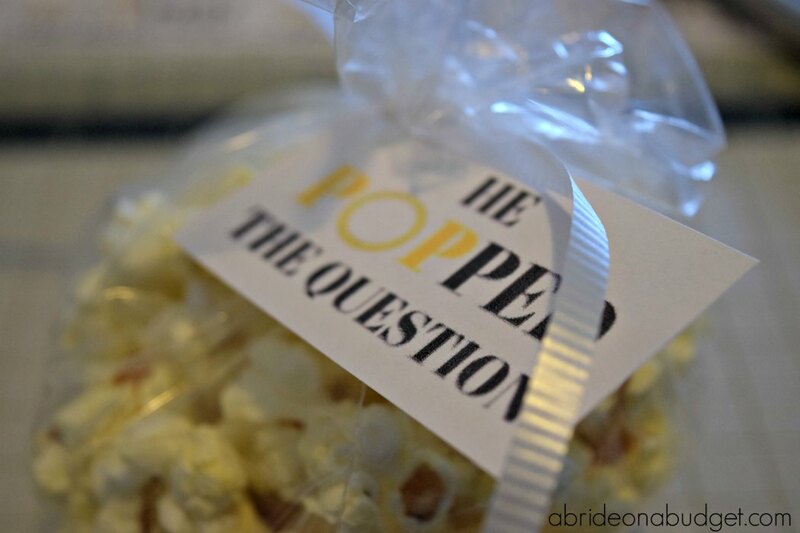 I'm obsessed with my corner rounders and use them all the time (like on our soap bridal shower favors). I didn't use them this time, just because I do use them a lot, but I would highly recommend you grab one and use it as often as possible. Use the one-hole punch to make a hole in the upper corner. I did it in the upper left, but you could do it in the upper right if you prefer. There's space on both sides. 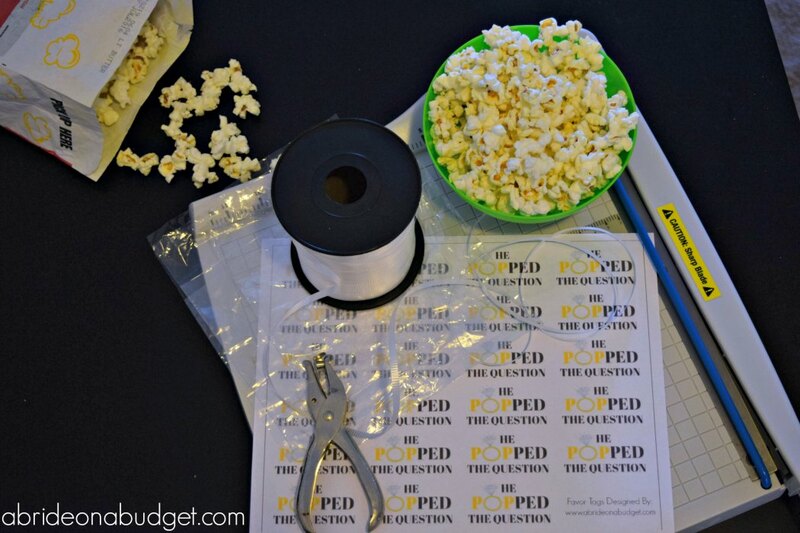 Stuff a sandwich bag with popcorn. Don't fill it completely, though, because you'll need a bit of room to be able to gather at the top. Tie the bag with ribbon. Curl the ribbon and you're done. Simple. 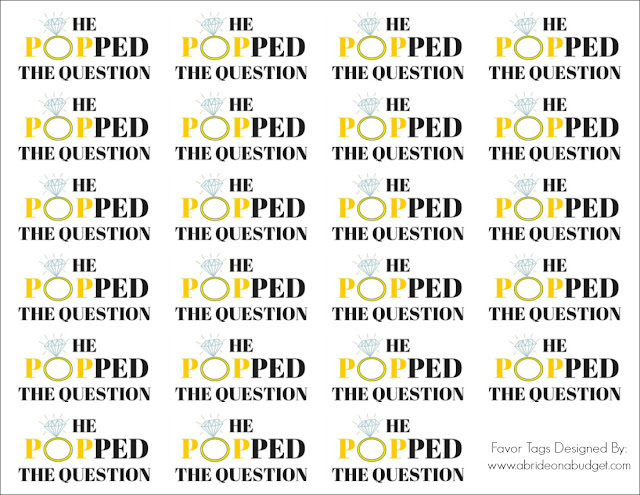 The favor tags are formatted to fit on an 8.5x11 sheet of paper (so standard printer size). All you need to do is right click the image above, save it, and print it when you need it. 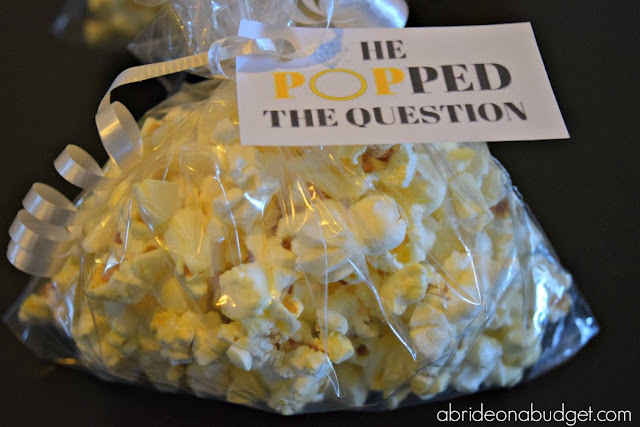 BRIDAL BABBLE: Would you make these He Popped The Question engagement party favors?